Discover how the differences in Brunswick tables add up to better playability and greater value. For more than 150 years, Brunswick has been the most recognized name in billiards. The reason for that is simple. Behind the Brunswick name is a total commitment to quality that stretches back to the first tables built by John Brunswick in 1845. 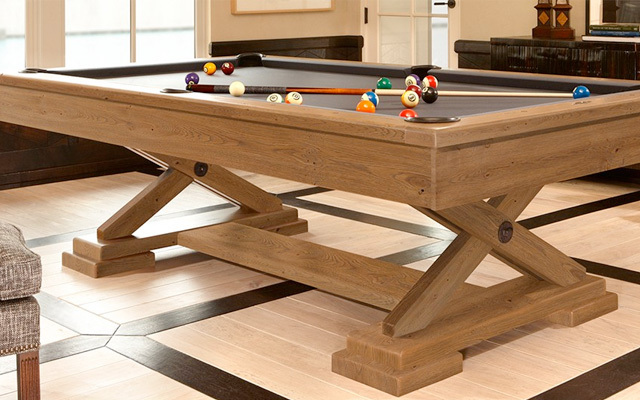 The quality shows itself in the superb playability and accuracy of Brunswick tables. In their craftsmanship. And in their styling. Used in more major tournaments around the world than those of any other company, Brunswick tables are the standard of the industry and are clearly the leader in resale value. Brunswick offers the largest product line with attractive options for almost any decor. Delivery is never a problem because a Brunswick table ships disassembled in boxes, which are designed to fit in any house. Banking and rebound accuracy rely on the nose height of the table’s cushion rubber. Brunswick’s automated, pneumatically controlled machines precisely place the cushion rubber ensuring that the nose height is consistent all around the table and meets the standard of 64% of a 2 1/4″ diameter ball.